The members of ‘NSYNC will be depicted in the upcoming Lifetime movie about Britney Spears and Lance Bass is sharing his thoughts on how the actors look! Lance will be portrayed in the movie by an actor named Connor Patton. READ MORE: See the official photos from the upcoming TV movie! Justin Timberlake & 'NSYNC Bandmates Leave Nice Guy After Reunion! Justin Timberlake steps out of The Nice Guy after the ‘NSYNC reunion on Monday evening (August 8) in West Hollywood, Calif.
Also seen heading out were Joey Fatone, Lance Bass, and birthday boy JC Chasez, who celebrated his 40th birthday that night. Chris Kirkpatrick was also there! Justin posted a photo of the epic reunion – be sure to check it out if you missed it! Justin Timberlake & 'NSYNC Reunite for JC Chasez's 40th Birthday! 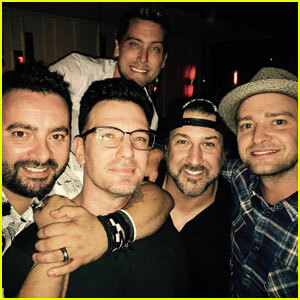 Justin Timberlake and the rest of his ‘NSYNC band mates had a very special reunion on Monday night (August 8) at a birthday party for JC Chasez! The 35-year-old singer, as well as Lance Bass, Joey Fatone and Chris Kirkpatrick, all reunited to celebrate JC‘s 40th birthday! Justin took to his Instagram to share a group shot of the band posing together at the party. “JC‘s 40th… And, if you don’t know now you know…” he captioned the image. Also in attendance at the party were Chace Crawford, director Bryan Singer, producer Dallas Austin, 5 Seconds of Summer bandmate Luke Hemmings, Brody Jenner, Darren Criss and Tara Reid, who all enjoyed music from beeFOWL. Demi Lovato & NSYNC's Joey Fatone Star In Fall Out Boy's 'Irresistible' Video - Watch Here! Demi Lovato and NSYNC‘s Joey Fatone star in the brand new music video for Fall Out Boy‘s latest single “Irresistible“! With the news that Adele‘s record-breaking album 25 is going to have the biggest album sales week of all time, we thought we’d take a look back at the other fastest-selling albums in Billboard history. Adele will be smashing the record with an anticipated 2.9 million copies sold in the first week and there are 19 other albums that have sold more than one million copies in seven days. Taylor Swift holds the record for the most albums to have first week sales of over one million with her three previous albums – 1989, Red, and Speak Now. Members of the group N’Sync are reacting to Adele breaking their record for the biggest album sales week of all time. The guys released their album No Strings Attached back in 2000 and it sold 2.416 million copies in its first week of sales, a record that they’ve held for fifteen years and no one has come close to beating. In just over three days of sales, Adele has stormed past the record with her new album 25. 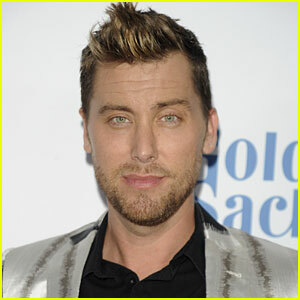 Read below to see tweets from Lance Bass and JC Chasez!